Whether he’s painting Casco Bay or Penobscot Bay, plein-air painter Matthew Russ’ oil landscapes possess a sense of spaciousness, with a low horizon line and a sky as important as the land below. 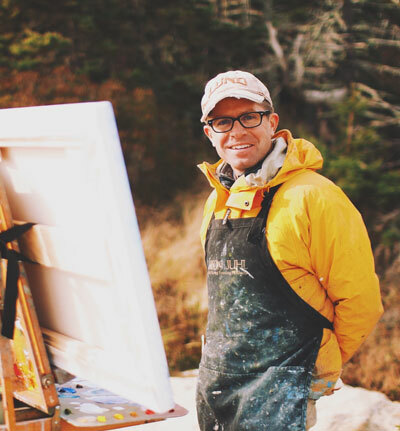 A Cape Elizabeth native who grew up summering on Cape Rosier, Russ is a graduate of Colby College, where he now works as a preparator at the Colby College Museum of Art. How does Maine manifest itself in your art? I’ve come to realize that one can discover familiar terrain again and again. In changing weather and light conditions, a place can reveal many different personalities. This notion has influenced me to work in a series format, returning to a single location repeatedly to produce multiple paintings. I recently completed five canvases of Richmond Island in Cape Elizabeth. I’ve known this view since childhood, but it thrilled me each time as if I was visiting from Kansas and had never seen the ocean before. How do you manage to paint outside year-round in Maine? Do you do studies in the field and then larger paintings in the studio? I don’t work from studies, but rather, complete each painting on-site. This infuses my paintings with a natural energy. Studio work can extinguish the spark, so I limit it to the smallest touch-ups when I return from the field. Oil paints are workable at high and low temperatures, so I choose to work in the full range of conditions too. Sometimes this means painting in shorts and sandals, but it also means painting in winter clothes, heavy boots, and gloves. Why did you choose Penobscot Bay from Bald Rock Mountain #5 for The Art of Giving? The view from Bald Rock Mountain is one of my favorites because it allows a full appreciation of the size and scope of Penobscot Bay. The expanse of ocean between islands is impressive, and it underscores how remote the island communities are. Tell us about your personal experience with your chosen charity, LifeFlight of Maine. My introduction to LifeFlight of Maine came in dramatic fashion. In July 2011, my wife KC was in a small plane that crashed into the ocean while flying from Matinicus Island to Owls Head. Both LifeFlight helicopters were deployed to meet the accident victims on the mainland. KC was transported to Lewiston, where she underwent life-saving surgery at Central Maine Medical Center. KC is doing great now, and we are both forever grateful to this incredible nonprofit organization serving all of Maine. 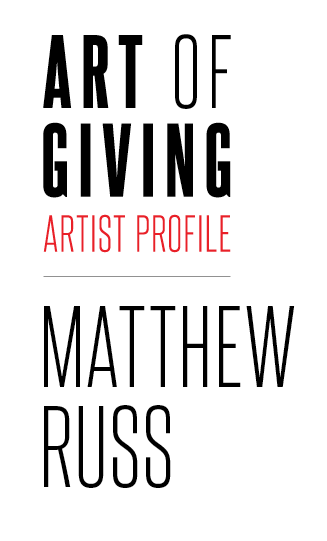 See more of Matt Russ’ work.